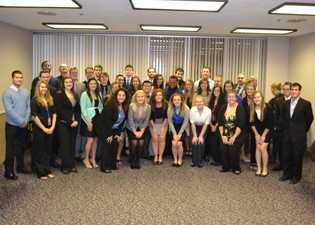 SIU College of Business students exhibit excellence during a conference held the weekend of October 31. The members of Pi Sigma Epsilon (PSE), a registered student organization for Salukis interested in sales, marketing and management, made their way to the University of Northern Iowa in Cedar Falls, Iowa, to attend a two-day regional conference for the Midwest chapters of this prestigious national organization. Roundtable discussions on leadership and chapter improvement. PSE corporate partners who comprised a career panel, giving advice on résumés and interviews. The SIU chapter members also had the opportunity to work with other members of the PSE organization, ending each night with a dinner and awards banquet. Some of the universities in attendance at the conference included Northern Illinois University, the University of Wisconsin-Eau Claire, the University of Wisconsin-Whitewater, DePaul University and the University of Northern Iowa. A marketing competition, one of the many conference activities, involved seven randomized teams ranging between five and seven members each. These groups were given the tasks of building a campus campaign for Brill Street, a Chicago-based company whose founder and CEO, Kevin C. Carlson, is a PSE alumnus. The company provides “Generation Y” college graduates with career consultation and placement based on their interests and personalities, and it also acts as a supplement to millennials’ job searches. Eleni Hampton, a member of SIU’s chapter of Pi Sigma Epsilon, took first-place honors during the marketing competition, along with four extraordinary PSE members from other Midwest region chapters. The members of the group won $500 to split among themselves – but that wasn’t all. Brill Street, which played host to the competition, wants to implement the group’s idea with the help of PSE chapters across the region. With only two hours to create their pitch, Hampton and her group came up with the idea to build the company’s digital and social media presence. From there, they created a small team of brand ambassadors – PSE members on Midwest college campuses – to create brand awareness about Brill Street on campuses using a variety of promotional techniques. When asked about her experience at the conference, Hampton said it opened her eyes to the fantastic organization beyond the scope of the SIU chapter. Hampton said she wouldn’t be where she is today without the support of the SIU College of Business and Pi Sigma Epsilon.